i-sense postdoctoral researcher, Dr Philip Howes and Deputy Director, Prof Molly Stevens from Imperial College London, along with Stevens Group member Dr Rona Chandrawati, have published a review on Colloidal Nanoparticles as Advanced Biological Sensors in Science. 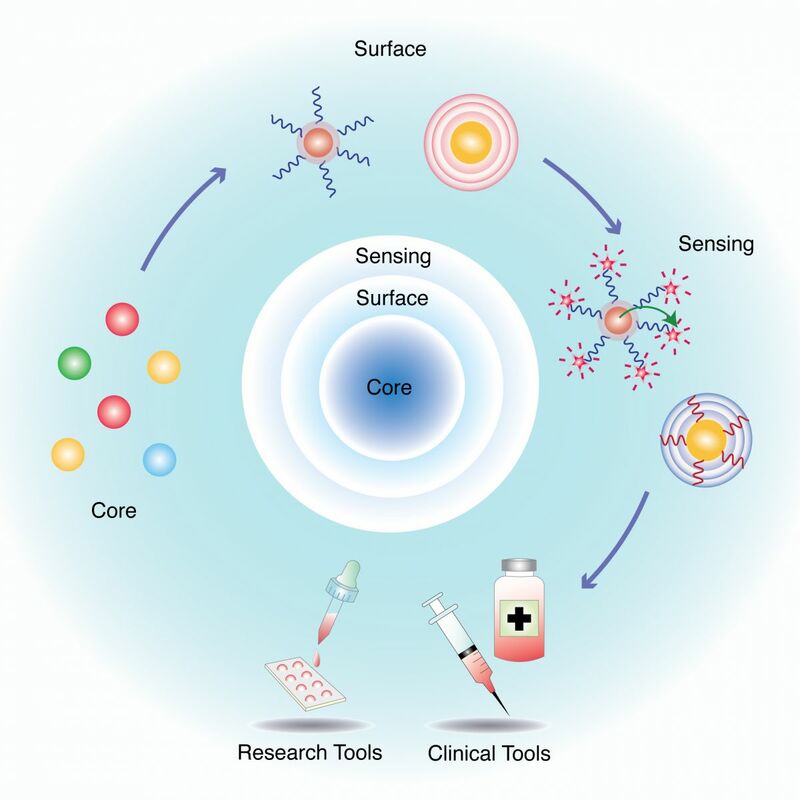 The review gives a comprehensive overview of the use of specialised nanomaterials as diagnostic tools and their applications in the global healthcare system, which includes approaches used in the i-sense consortium. Within i-sense, Dr Howes is using quantum-dot-based systems that can be used as components in diagnostic devices for the detection of specific biomarkers corresponding to various diseases. These quantum dots (QDs) may be biofunctionalised with ligands that detect various biomolecules such as RNA and DNA, giving an easy-to-read optical output corresponding to their concentration. Currently, Dr Howes is targeting systems capable of detecting flu biomarkers using QD-based devices. Prof Molly Stevens’ team uses a variety of multidisciplinary approaches in designing and developing their biosensing systems, which have been reported in multiple journals. Overall, the Stevens Group comprises of engineers, synthetic chemists, material chemists, cell biologists and surgeons, who use interdisciplinary approaches for creating innovative ideas in regenerative medicine, tissue engineering and biosensing. The Stevens group are an award-winning research programme and have accolades such as the EU40 Prize for best materials scientist under the age of 40, a listing in the Times for best scientist under the age of 40 and the 2014 European Life Sciences Research Group of the Year. Within i-sense, they are targeting the next generation of nanomaterial-based systems capable of specific biomarker detection corresponding to infectious diseases.